Added by Debra Tash on September 1, 2016. 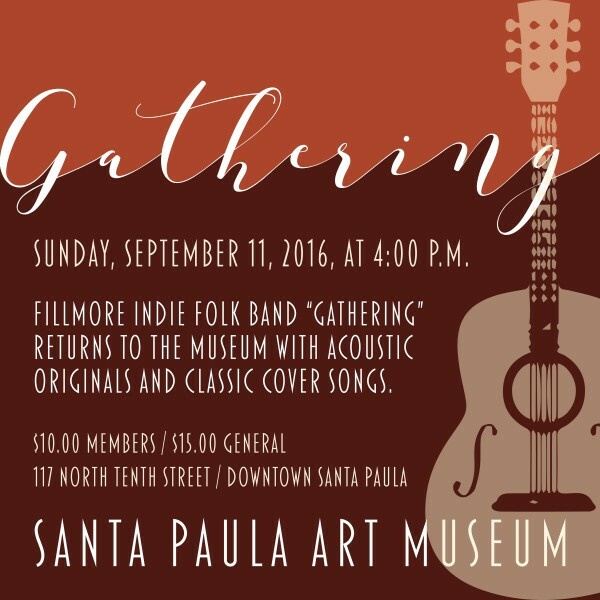 Sunday, September 11, 2016, at 4:00 p.m.
Fillmore indie folk band “Gathering” will return to the Santa Paula Art Museum with a concert on Sunday, September 11, 2016, at 4:00 p.m. Guests will enjoy an afternoon of art and music as the popular local group performs an acoustic blend of styles and genres inside the Museum’s main gallery. Admission to the concert is $10.00 for museum members and $15.00 for the general public. Gathering features musicians Bill Bartels, Eric Brown, Gregg Cassity, and Teddi Cassity. The bandmates describe themselves as a group of friends who, through time, make music. Folk influenced and harmony driven, Gathering’s sound is completely unique, and their talents have earned the group a devoted following. The band’s current tour, entitled “These Days,” is a narrative journey filled with original songs, as well as creative covers of classic tunes. The Santa Paula Art Museum is located at 117 North Tenth Street in beautiful downtown Santa Paula. The Museum’s regular hours are Wednesday through Saturday from 10:00 a.m. to 4:00 p.m., and Sundays from 12:00 p.m. to 4:00 p.m. Regular admission is $4.00 for adults, $3.00 for seniors, and free for museum members and students. For more information, please call (805) 525-5554, or email info@santapaulaartmuseum.org.